Front row, from left, Jess Boulet ’19, Rachael Chen ’19, McKenna Hunter ’17 and Juliet Michaelsen ’19; Back row, from left, Alicia Ireland ’20, Joanna Hamilton ’19 and Salma Shawa ’19; Not pictured: Michael Spanos ’17 and Ray Carville ’17. 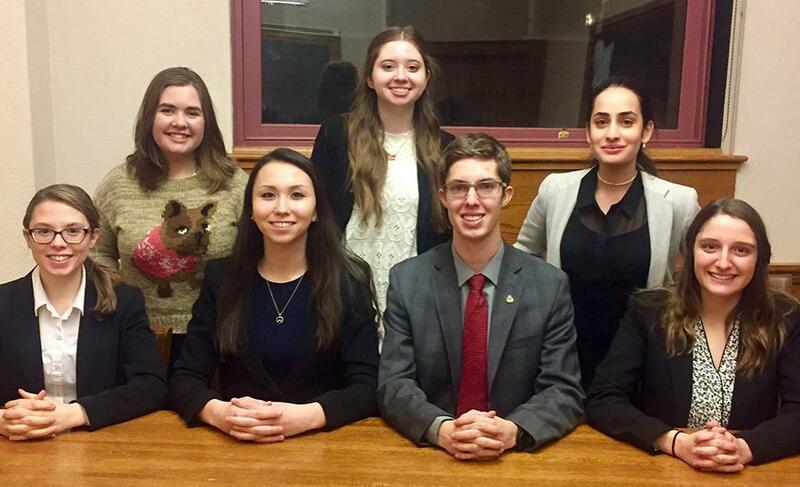 Clark University’s Mock Trial team recently earned individual awards and a sportsmanship award at the American Mock Trial Association Regional Tournament at Yale University. Due to its exemplary performance, the A team received an at-large bid to the Opening Round Championship Series Tournament to be held March 25 and 26 in Wilmington, Delaware, where it will compete against teams from Rutgers, Princeton University, the College of William and Mary, and George Washington University. 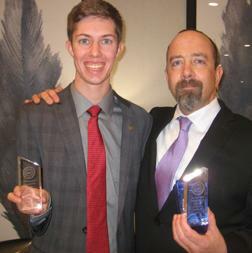 McKenna Hunter ’17, left, and Ray Carville ’17 pose with their awards. Clark’s A team won the Spirit of American Mock Trial Association Award for “the team that best exemplifies the ideals of honesty, civility and fair play.” In addition, three students on the team earned individual awards: Marlee Faranetta ’20 and Ray Carville ’17 won Best Witness awards and McKenna Hunter ’17 won a Best Attorney award. The veteran A team finished with a 5-3 record, with wins over the University of Massachusetts Dartmouth and the University of Massachusetts Amherst. They split ballots with Williams College and lost to Boston University. The novice B team competed against teams from the College of the Holy Cross, the University of Connecticut, Stonehill College, and Quinnipiac University. 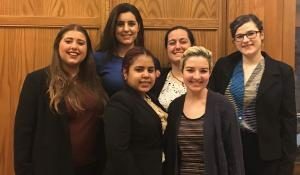 Clark’s Mock Trial novice B team: Front row, from left, Yenifer Cabreja ’19, Marlee Faranetta ’20; Back row, from left, Amanda Quinones ’20, Isabella Mejia ‘20, Hannah Cooper ’20 and Aitana Doster ’20. Not pictured: Eva Rosenweig ’20. In the intercollegiate mock trial competition, students role play as lawyers and witnesses and are judged on their persuasiveness and ability to analyze arguments. Clark team members take Trial Advocacy for credit in the fall semester. Both the fall course and the spring competition are taught by alumnus Steven C. Kennedy ’88, a practicing attorney and trial lawyer.